But worry no more! 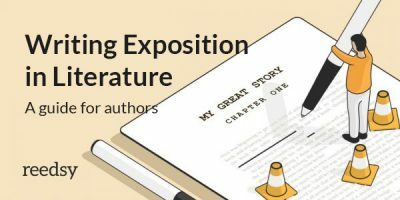 This guide will take you through all the ins and outs of that pesky, pernicious prose, from its precise definition to how to prevent it in your writing. Purple prose is overly embellished language that serves little meaningful purpose in a piece. It’s characterized by strings of multisyllabic words, run-on sentences, and blocks of unyielding text. Universally discouraged by all manner of writing experts, purple prose slows the pace, muddles the content, and can lose the reader entirely. Very difficult to get through, no? 1. The writing draws attention to itself and away from the narrative or thesis. 2. It’s too convoluted to read smoothly and can disrupt the pacing of your story. Think of purple prose as a cardboard cutout of a celebrity. From a distance it looks convincing, even impressive — but as you draw closer, you realize there’s nothing behind it. Purple prose is like that: beautiful from afar, with very little substance to it. 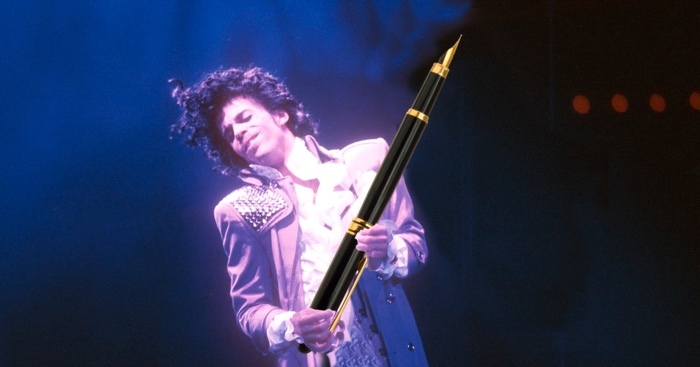 The Purple Prince: he may look glamorous, but he's a no-go for your writing! 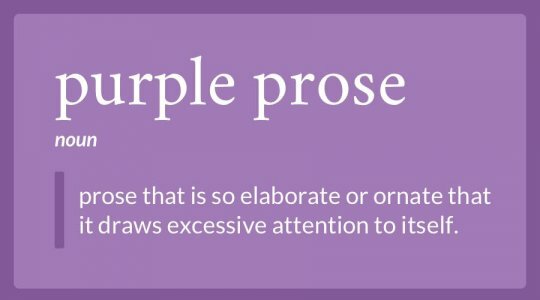 To clarify, the term “purple prose” doesn’t just automatically apply to any kind of dense or elaborate language. This is a common misconception, perpetuated by diehard fans of minimalism and Ernest Hemingway. Purple prose specifically refers to overblown description that fails to add to the text, or may even detract from it. One feels even in the midst of the traffic, or waking at night, Clarissa was positive, a particular hush, or solemnity; an indescribable pause; a suspense (but that might be her heart, affected, they said, by influenza) before Big Ben strikes. There! Out it boomed. What passes for hip cynical transcendence of sentiment is really some kind of fear of being really human, since to be really human [...] is probably to be unavoidably sentimental and naïve and goo-prone and generally pathetic. “Purple prose” is often used as an insult for highly lyrical or complex language that some readers dislike. But don’t be fooled — actual purple prose lacks the elegance and cohesion of these examples, and distracts from the text rather than enhancing it. Remember: not all elaborate prose is "purple"! In this section, we’ll look at various samples of purple prose in published work and try to revise them. You’ll notice that all of these passages have slightly different problems, which can be addressed via distinct methods to help them read in a smoother and more satisfying manner. — even in fight scenes. 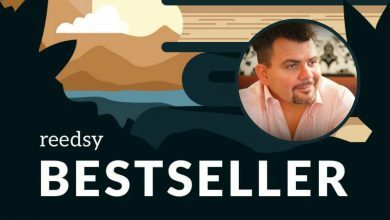 This is especially true for Paolini’s second book, Eldest, which follows the characters established in his first book Eragon. Saphira’s muscled sides expanded and contracted as the great bellows of her lungs forced air through her scaled nostrils. Eragon thought of the raging inferno that she could now summon at will and send roaring out of her maw. It was an awesome sight when flames hot enough to melt metal rushed past her tongue and ivory teeth without harming them. Revised passage: Saphira breathed heavily, her nostrils expelling warm air. Eragon sat and marveled at her power. 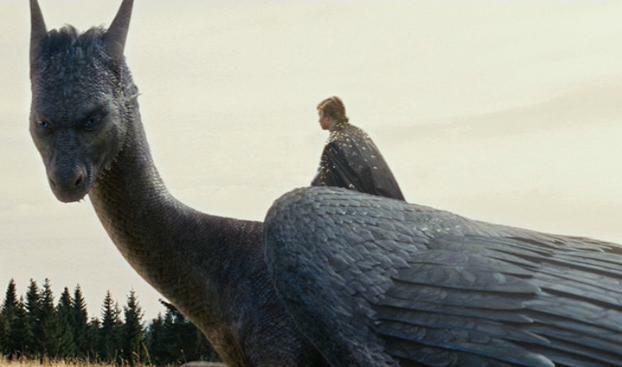 It was amazing that Saphira's fiery breath could melt metal, yet she was immune to its harm. Sean Penn’s 2018 debut novel left critics flummoxed, and not just because of its unusual plot — it’s also chock full of purple descriptions that had readers scratching their heads. Though Bob Honey is supposed to be satirical, that doesn’t explain or justify the nearly inscrutable language Penn employs. There is pride to be had where the prejudicial is practiced with precision in the trenchant triage of tactile terminations. This came to him via the crucible-forged fact that all humans are themselves animal, and that rifle-ready human hunters of alternately-species prey should best beware the raging ricochet that soon will come their way. Revised passage: We can take pride in the act of hunting, if it is practiced with care. Bob Honey knew this when he realized that humans are animals too. We should all be thoughtful and deliberate in the act of hunting — for we can easily become the hunted ourselves. My friend B'loody Mary Smith smiled at me understatedly. She flipped her long waste-length gothic black hair and opened her crimson eyes like blood that she was wearing contact lenses on. She had pale white skin that she was wearing white makeup on. Hermione was kidnapped when she was born. Her real parents are vampires and one of them is a witch but Voldemort killed her mother and her father committed suicide because he was depressed about it. Solution: Delete passage and restructure entire piece. Some prose is so bad that it’s not worth trying to fix — fortunately, My Immortal is such an outlier that almost nobody need resort to such extreme tactics. Since purple prose is a hallmark of poor writing, you want to avoid it at all costs. Unfortunately, it’s all too easy to fall into the “purple trap,” especially as a novice writer trying to develop a sophisticated style. For those concerned, this section will give you some ground rules to help you avoid that flowery demon of writing. This is the most essential tip to remember if you’re worried about purple prose. Because purple patches result from trying to sound more “literary,” they often crop up when you’re attempting to imitate a more advanced writing style. While it’s great to have writing role models, no one likes a copycat — especially when your impression consists of long, ostentatious descriptions. 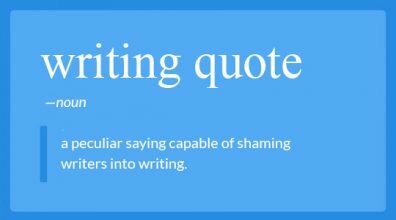 So if you find yourself writing purple prose because you’re trying to sound like someone else, stop and reevaluate. You’re likely mimicking another writer’s voice because you’re struggling to find your own. Look back at old work to see how you used to write. Even if you’ve evolved way past that style, it’s a good reference point for the foundation of your current voice. Try freewriting or journaling to achieve a similarly unaffected style. If you’re really at a loss, you can simply ask other people how they would describe your quintessential voice, and use that as a jumping-off point for some creative exercises. It can also be helpful to stay away from especially strong literature during your drafting process. Other authors’ styles can seep into your writing, even subconsciously, making it sound purple and ring false. So as inspiring as Fitzgerald and Nabokov might be, it’s best to take a step back from them when you’re working on your own voice. 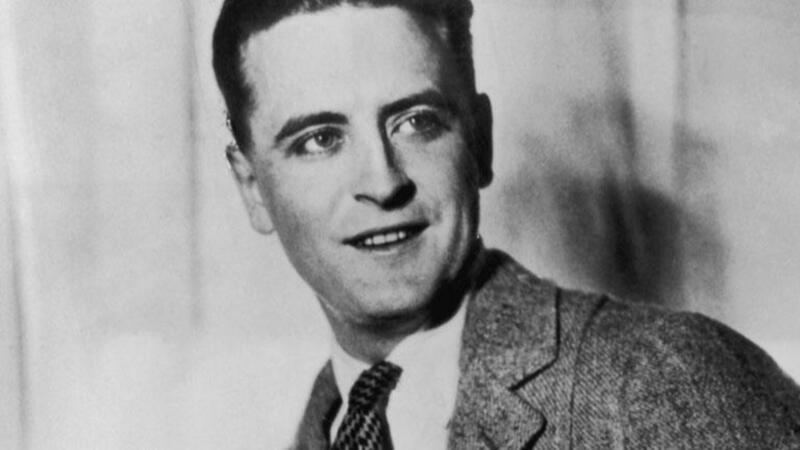 Fitzgerald loves you — but he wants you to find your own voice! 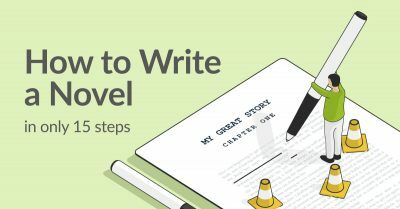 You can’t go wrong putting most of your energy toward the plot of your story (or the main “thrust,” depending on what kind of piece you’re writing). As long as you stay focused on substance, the purple prose issue should take care of itself. Of course, that’s easier said than done, so make an effort to stay aware of your plot progression as you write. 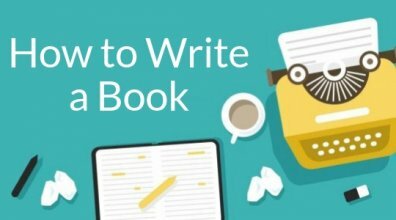 Create an outline before you begin and allot a rough number of pages for each specific point. 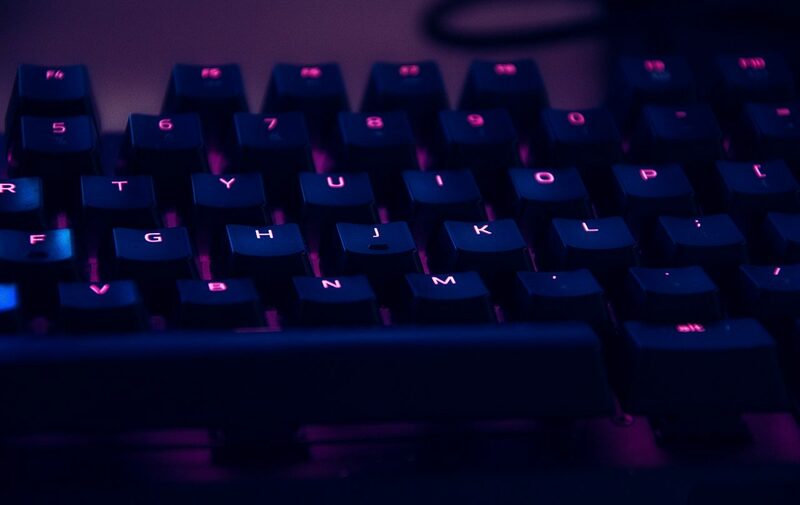 If you start to exceed those page limits, you’ll realize you’re probably writing too purple; this will prompt you to consciously refocus on substance. Alternately, if you have the opposite problem — you need to flesh out more chapters, or reach a higher word count — don’t turn to purple prose. Turn to substance! Include an interesting detail that you may have left out of your initial outline, introduce a new character, or pull a twist out of thin air. Any of that’s better than droning on in a description just to take up a few more lines. A thesaurus is a double-edged sword when it comes to the quality of your prose. It can be great for fixing repetition and occasionally finding substitutes for words, but it can also result in purple passages that sound like Joey’s adoption letter. "It doesn't make any sense." "Of course it does, it's smart! I used a thee-saurus!" With that in mind, if you’re pulling out the thesaurus (or the online thesaurus tool) to use on every other word, you’re probably over-synonymizing. A thesaurus provides plenty of linguistic alternatives, but they’re usually not the most appropriate or organic words for your piece. This produces none other than the dreaded purple prose. A classic example of thesaurus misuse is when writers try to sub in different words for “said”: uttered, pronounced, vocalized, articulated. The idea is to use variety to keep things interesting, which is generally a good goal for your writing. However, in context, these dialogue tags often sound ridiculously purple. 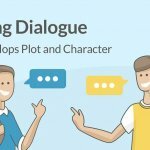 They draw attention to themselves and distract from the actual dialogue, which is not what effective prose should do. When it comes to word choice, use a thesaurus sparingly, and try to embrace the “simpler” words in your text. Just because you can replace them with something fancier, doesn’t mean you should. 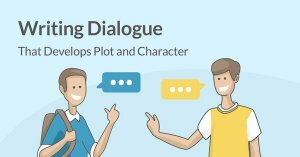 Not every passage has to move the story forward, but it should engage the reader in one way or another: through a description that reveals something about a character, poses a question to be answered later, or simply contains relevant, enticing details. So when patrolling for purple prose, think actively about whether a first-time reader would be intrigued by a potentially purple passage. When evaluating a description, ask yourself: if I were reading this with fresh eyes, would I find it enjoyable, or frustrating? If it sounds obscure, does that serve a purpose, or is it just obscurity for obscurity’s sake? If you have trouble putting yourself in your readers’ shoes, get some beta readers! This is particularly helpful when you’re writing a piece and you suspect your prose may be verging on lavender, but you’re too close to be objective. Send what you’ve written so far to friends or fellow writers. They’ll tell you which descriptions are strong and what can (and should) be cut. As long as you write in your own voice, focus on substance, and avoid phrasing that sounds unnaturally ornate, your prose will easily steer clear of purple and head straight for the gold. What's the most purple thing you've ever written? Just for fun, leave it in the comments below! 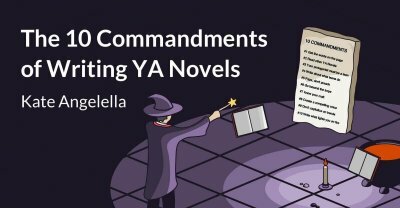 The Ten Commandments of Writing YA Novels.